Please keep Mikko in the WRC! Rumour has it that Mikko Hirvonen, who currently spearheads M-Sport’s WRC-effort, will quit the World Rally Championship after the end of the season. Let’s hope that it proves to be just that, a rumour! Update: Sadly, it wasn’t. Announcement on November 6th 2014. He took us all by surprise, the young Finn, when he had piloted his Ford Focus in to service at Vikingskipet in Hamar, Norway in 2007. 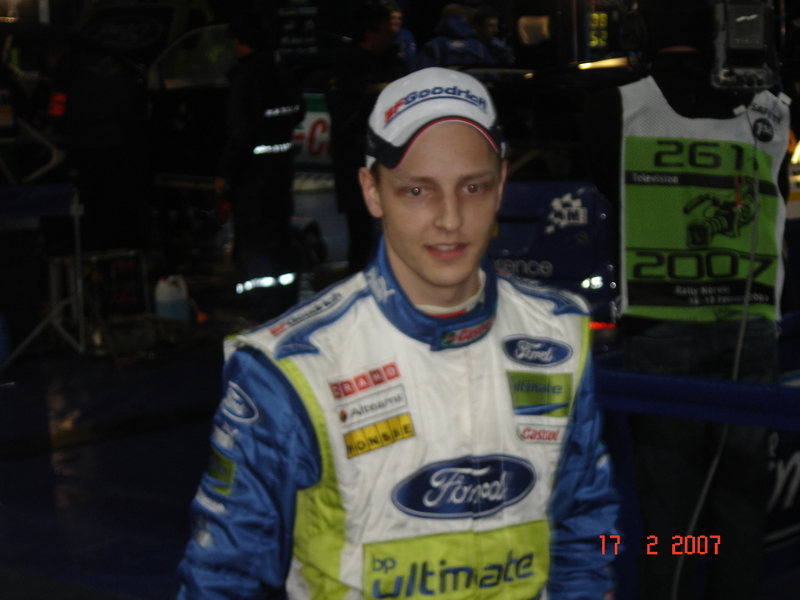 My son and I were standing as close to the Ford service area as we could get, and now Mikko Hirvonen was coming towards us (photo below) and the other spectators, ready to sign his autograph. But what to sign on? Luckily the Ford personnel quickly provided us with small flags for Mikko to sign. That flag still rests in my son’s bedroom. We have followed his career since then, as I managed to convey to him a long with a quick handshake at the service park of Rally Finland earlier this month. 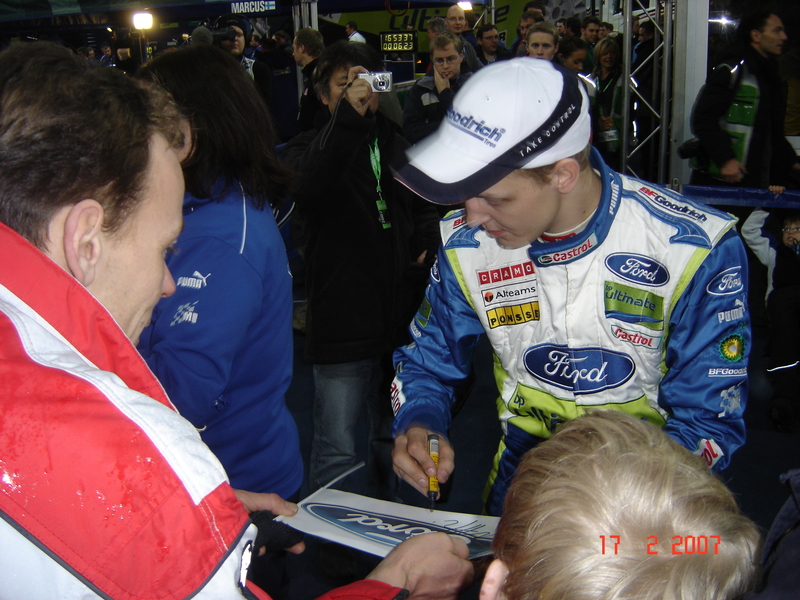 My son and I watched him win in that memorable first WRC event in Norway in 2007 (third over all that year), coming second in Sweden in 2008 (second also over all), second again in Norway in 2009 (and losing the championship to Loeb with only one point that year), missed out (!) on his victory in Sweden in 2010 (sixth over all), cought up with him again when he won Rally Sweden in 2011 (second over all), and were also present when he became runner-up in Sweden in 2012 (same position over all). In Sweden in 2013 his luck turned though, getting stuck in a snow bank in SS2 and finishing the rally in seventeenth place (fourth over all). 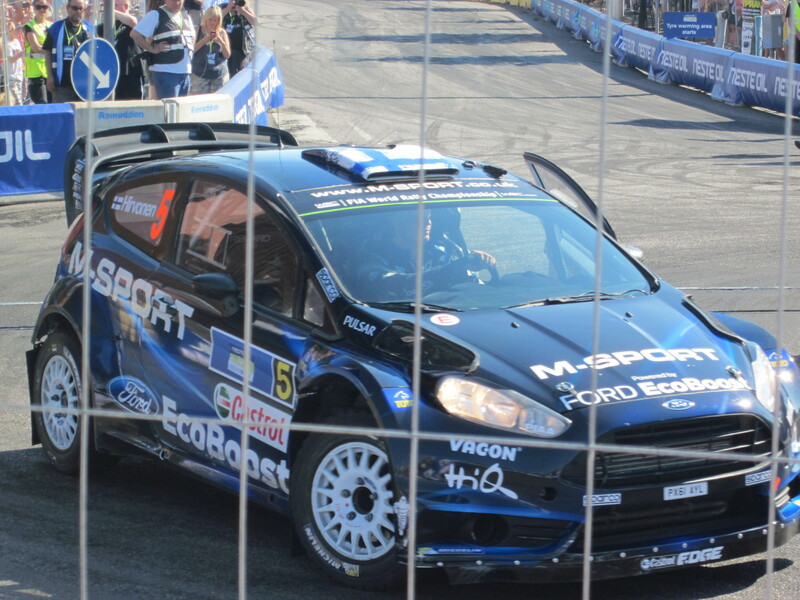 Then in Rally Finland of this year we watched him come in fifth in his home event, which is also his current standing in the driver’s championship. 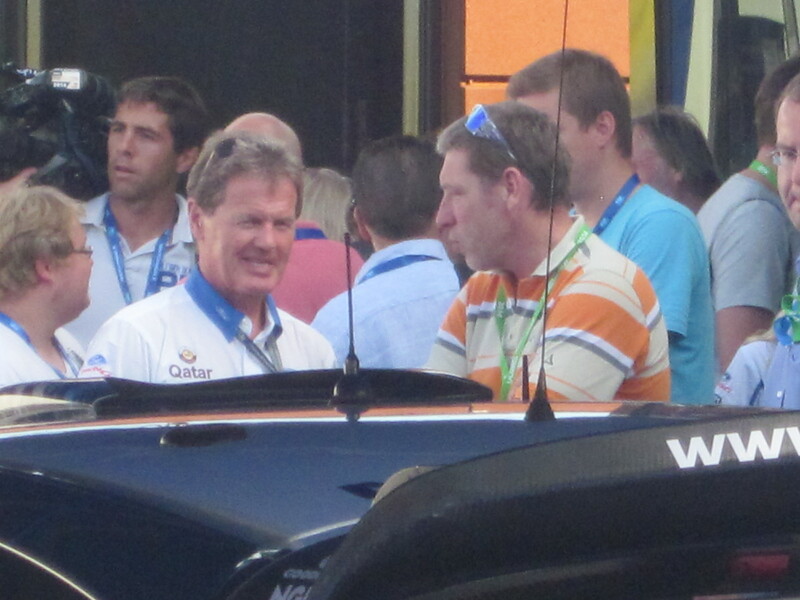 Mikko’s contract with M-Sport is up at the end of this year, and the interviews with team boss Malcolm Wilson (photo below) that I have heard or read, do not give grounds to rest assured that Mikko will be offered a new contract. 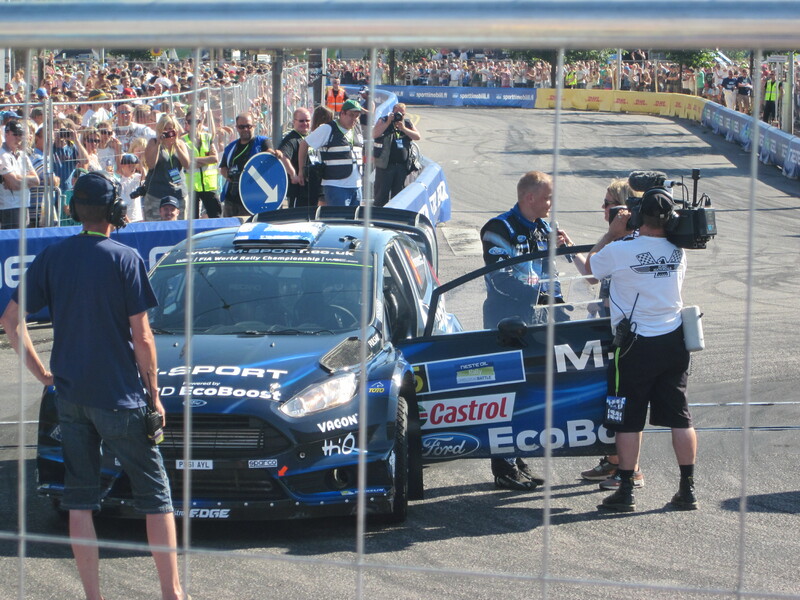 After Rally Germany Wilsom came very close to question Hirvonen’s motivation. The reports of his supposed withdrawal started spreading Thursday of this week. The Finnish news outlet Yle News may have been first, quoting Mikko’s manager, in Finnish, that Hirvonen would leave the championship after Rally Wales in november. Although the final decision had not been made, they were no longer considering anything in the wrc for 2015, according to a bad translation of the Finnish story. On Twitter Mikko is rumoured to have had an offer from Toyota to become their test driver. Luckily Mikko himself has commented on the situation. Today, on his Facebook-page, he writes that “nothing has been decided yet”, adding, though, that he is “considering all the possibilities”, and that he will let his fans know when he has made up his mind. Talking also to Autosport’s David Evans today, Mikko goes one step further, saying that he “wants to remain in the sport” and that “he has options for 2015”. That is the must reliable information I have seen up to now, and I sincerely hope that this is how the case stands. There are, however, telltale signs that Mikko is not having such a good time in the WRC that he used to. In Rally Finland he talked about losing seconds because he was hesitant, My thoughts started spinning then about the reason for this hesitancy. I think I found a clue in what rally winner Jari-Matti Latvala said at one stage end. Words to the effect that when you can place complete trust in the car, it is easy to achieve the necessary good rhythm and self assurance. Is that what Mikko has been struggling with the last couple of years – that he doesn’t trust the machinery he is issued with? I am inclined to think that it at least is part of the problem, and that is also the reason for the title of this blog post (mimicing the name of the Facebook-group that was formed to encourage Ford to stay in the WRC as a factory team). In the piece by David Evans, when asked about the potential for remaining at M-Sport, Mikko is quoted like this: “There are some things coming with the development [of the car], but it would be nice to get into a position where we are not thinking about money all of the time”. He is clearly hoping for technical advancements on the Fiesta, indirectly saying that the level of the car M-Sport has now, can be raised. The reason being not the legendary Mr. Wilson, but the shortage of money that befell M-Sport when Ford pulled out. Gerard Quinn, head of Ford Racing in Europe, promised me at the time, on Twitter, that Ford would continue to support M-sport, and I do believe that they have. But in spite of this, I gather that M-Sport must spend more time than the factory teams on securing sponsors, and that they do not have the same amount of resources as their competitors. That may result in M-Sport not having cars that are a 100 per cent competitive. So, Mr. Quinn, do you have even more Ford-money and resources to put into the hands of Malcolm Wilson, thus bettering M-Sport’s chances of winning with the blue oval, and provide Mikko Hirvonen with a car that can give him the confidence that he so clearly needs? As Mikko altso says to David Evans: “I still believe I’ve got what it takes to win”. Many of us believe that too, Mikko! “That was a long time (of following)”, Mikko replied in our aforementioned very brief exchange of words at the service park in Rally Finland. Let us hope that there will be a long time still for the amiable Finn in the WRC. The championship will miss him if he leaves now. Another rumour on Twitter: Kris Meeke will be partnered by Petter Solberg at Citroen in 2015! That would be fun, provided that Mads Østberg also gets a factory seat! He expanded on this in the pre-event press conference, but didn’t really give much away.